Erin Bates is a famous sportscaster currently working for Speed TV as their Supercross and Motocross presenter. Besides a sportscaster, she is a Television Broadcaster, TV Host, Live Announcer, Spokes Women, Model, & Adrenaline Junkie. She is also popular as the girlfriend of a famous sports car racer Brian Vickers. Erin Bates is reportedly earning around $50,000, annually with a total net worth of over $500,000. Erin was rumored to be in a relationship with Brian Vickers but the couple is rumored to have separated. Erin Bates was born in 1979 in Canada. She holds a Canadian nationality and belongs to White ethnic group. Originally, Bates is from Kelowna, BC, Canada. The detailed information regarding the parents, siblings and also about educational qualifications of Erin is not available on media. The net worth of the Canadian sports reporter Erin Bates is estimated at $500,000. By 2019, the reporter receives an annual salary of $50,000 which is similar to the sportscaster Max Kellerman, from her successful Speed TV reporting career. In addition, Speed TV reporter receives an additional amount of money from her radio and television appearances as a sports expert. Erin Bates is one of the most popular anchors in Speed TV that has made a successful career as an anchor. Since Speed TV is a popular sports network, it is well known for paying its sports carriers a high salary. Since Erin Bates is a regular anchor for Speed TV, she earns a decent wage from the network. Bates started her career as a pharmacy technician, an insurance agent and in advertising sales. Starting in 2003, she worked as a stadium pit reporter for AMA Supercross and Motocross and in 2006 she joined the broadcasting team of SPEED TV. Her motorcycle racing career began as a trophy girl in the international motocross freestyle association. 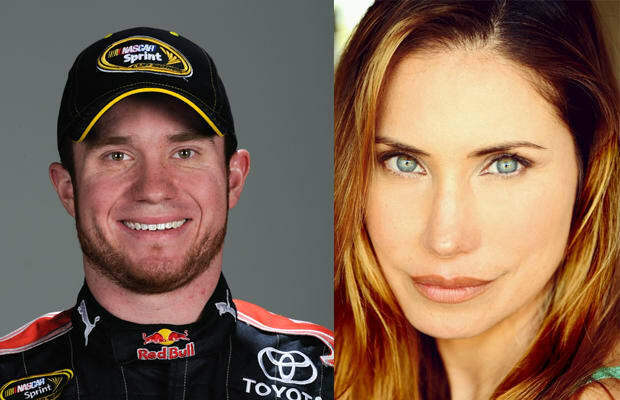 Erin Bates was currently in a romantic relationship with the famous sports car racer Brian Vickers but there are no any reports on if the couple is still dating. They were first spotted together in July 2009. They were seen together when Vickers invited Bates to stand on the podium with him before the LifeLock400 and were photographed together at several events since then. Brian Vickers is the native of North Carolina and is a famous car racer, and he loves to travel, rock climbing, surfing, cycling. Some sites claimed that the couple has separated. Besides, Erin Bates was married once but later divorced her husband. On September 2016, she shared her photo in wedding dress where she has captioned, "#FBF What were you doing 15 yrs ago today? ???????? #onceuponatime #thishappened #pastlife #noregrets". According to the post, she has no regrets of her divorce from her former husband. The beautiful Speed TV reporter has a perfect body shape with blonde hair and hazel eye color. Further details about her body measurements are not available. Other than being a famous reporter she is quite popular in social media with a huge number of fan following. So far there is no news of them getting married but she might be planning to get married soon.